Tip – To maximize your chances of successful stain removal, it is important to get to the stain before it has had a chance to set in. So try and get to work removing the stain as soon as you possibly can. If it’s a wet ink stain, first lightly dab at the stain so you soak up the ink without letting it spread. After the stain dries, dab alcohol on to it and then dab the reverse of the stained fabric with a paper towel so that it soaks up the alcohol, along with the ink that it is dislodged by the alcohol. Keep using fresh paper towels to mop up more and more and more of the stain. Tip – in a pinch, hair spray can also work. A hand sanitizer (these are typically alcohol based) will help do the trick as well. Soak the stain in this and then wash the garment in the hottest water that the care instructions allow. Also add bleach to your wash (again check the instructions) and then air dry your clothing. Repeat process if required. For printer ink spills on white fabric, chlorine bleach in cold water typically works well. For colored clothing, use a dilute mixture of ammonia detergent, again in cold water. Tip – use cold water and not hot; do not mix chlorine bleach and ammonia. Dab Isopropyl alcohol or rubbing alcohol on to the stain – work from the outside in to prevent the stain spreading. Now blot the stain to mop up the ink that has been dislodged (the alcohol may take some time to dissolve the ink so you may need to be patient). I may be a good idea to rinse out the area with vinegar diluted with water. For persistent stains, you could use shaving foam: leave on for about 15 minutes and rinse with water and vinegar. Hydrogen peroxide may also work on stubborn stains. That rubbing alcohol will come in handy again - dab the alcohol on cotton balls and gently apply to the stains on your skin. Other stain removers for skin that can work include petroleum jelly, nail polish remover, hair spray, vinegar and milk (yes milk!) – dab on to the skin and scrub off with a baby wipe. Wash the stained area of skin with exfoliating soap or scrub to take off residual ink stains. Gritty soaps like Lava work pretty well. If the rough handling made your skin feel a little dry, smooth on some moisturizer to soothe it. 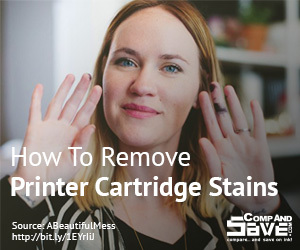 If you have any ideas to share regarding removal of ink stains from the skin, clothes or carpets, or have a particular method that works well, we would love to hear about them. Feel free to share in the comments below.